[Blind Gossip] Let’s talk about a Game of Thrones real life couple! This one is interesting because the actor and actress actually began dating before Game of Thrones began! They broke up and went their separate ways, but got back together again when they were both cast in the series. They never made the relationship public, but everyone on the set knew what was going on. Why? Well, because they often did not get along! They were on and off for several years. During their “off” times as a couple, the tension between the two was so great that they had to be kept separate on set! They did not want to even speak to each other. They also did not want to do any promotional events together. Since they have both been on the series since the first season, the cast and crew are well aware of the situation. As of right now, they are not a couple. However, since they have gone back and forth on this before… that could always change! BONUS CLUE 1: They do NOT play a couple on the series! 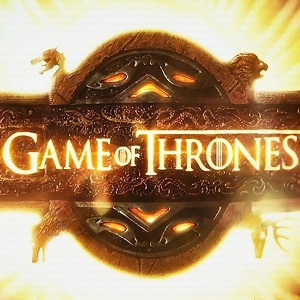 BONUS CLUE 2: They were BOTH featured in last Sunday’s episode, Eastwatch! BONUS CLUE 3: The actor’s character did not drown! [Optional] Do you think they would make a good couple off screen? 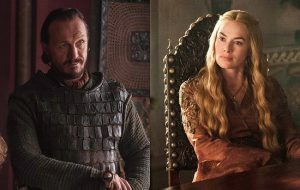 Did you know that the actors who play Queen Cersei Lannister and Ser Bronn of the Blackwater used to date in real life? However, their breakup led to serious issues on the set of Game of Thrones. In the seven seasons of the show… the two have never appeared in a scene together! Did you watch Sunday’s season finale? During the scene where all the team members of the three monarchs (Cersei Lannister, Daenerys Targaryen, and Jon Snow) meet in the Dragonpit, there was an awkward bit where Ser Bronn turns to Podrick and invites him to step out for a drink. That little exchange made no sense! Why would Bronn and Pod leave during the biggest meeting in the series history? Well, it’s because Lena Headey refused to film the scene with Jerome Flynn! The two dated before the series began. Then, once the series started, they seemed to get along again. Yes, it’s messy. Eventually, the tension led to the two completely avoiding each other. From a production perspective, this became awkward because Ser Bronn was close to the Lannister family. Bronn is a sellsword (mercenary). He fought on Tyrion Lannister’s behalf in “trial by combat” against Vardis Egen. 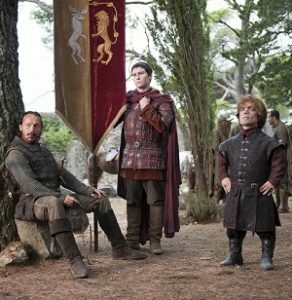 When Tyrion Lannister became Hand of the King, Bronn was eventually named Commander of the City Watch in King’s Landing. He was rewarded with a knighthood for the vital role he performed during the Battle of the Blackwater. Yet in all the time he was in King’s Landing, he was never in a scene with Cersei. Two important characters in the same place at the same time… but no scenes together! 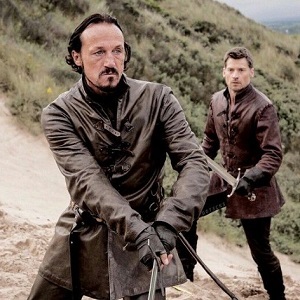 Bronn then spent a couple of seasons working side by side with Jaime Lannister. He rescued Cersei’s daughter, Myrcella Baratheon, from Dorne. Bronn helped Jaime to take back Riverrun castle. The two of them went back to King’s Landing in time to witness Cersei being crowned Queen. Still, no scenes with Bronn and Cersei. Bronn then helped Jaime capture Highgarden and accompanied Jaime in the convoy back to King’s Landing. Bronn critically wounded the dragon in the convoy scene, pushed Jaime into the river just as he was about to be killed by the dragon’s fire, and then saved him from drowning. Yet, despite saving three members of the Lannister family… and spending lots of time in King’s Landing… Bronn and Cersei never do a single scene together! For a while, the producers were hoping that the two would get along well enough to do that critical scene in the Dragonpit together, but it did not happen because Headey refused to film with Flynn! Her character, Cersei, was more critical to the scene, thus forcing his character, Bronn, to awkwardly depart the meeting and the scene. Jerome and Lena aren’t on speaking terms any more and they are never in the same room at the same time, It’s a pity because they appeared to have patched things up for a while, but now the word is they should be kept apart at all costs. We’re not a couple right now, people have seen us together and jumped to conclusions. I can’t rule out a relationship with her in the future, I just don’t know. Let’s hope they patch things up for the final season. In the meantime, we could all use a drink! Congratulations to MarySunshine for being first with the correct response! Like the SOLVED items? Click HERE for more! Hannah Murray (Gilly) and Joe Dempsie (Gendry)! Both were on Skins before GOT! Gilly wasn’t in the show since season 1. Me too! Ohh, but now that I see clue #3, I guess it has to be Jerome Flynn. Damn. Jerome Flynn and Lena Headey? They’re two of the few people who have been on the show but were old enough when it started to have had previous relationships beforehand (so not Sophie or Maisie). This might explain why Bronn, despite hanging around Lannisters so much, hasn’t ever really had scenes with Cersei. They’d be around each other on set though, since the characters are usually in the same overall place. Ooooo I know this one! It’s Jerome Flynn and Lena Headey. Apparently quite a volatile couple. Supposedly they dated in the early 2000’s. Lena Headley and Jerome Flynn. I must prefer her with Pedro Pascal myself. Though funny that she asks Jamie to punish Bronn after he “betrays” him. I heard this too. Heard she HATED Jerome after they initially dated. Bronn and Cersei. They dated in 2005 and are never on screen together because they have to be separated on set. Hi Ace! Longtime lurker, first time poster – I love your site!! They’ve dated in the past and there have been multiple stories/interviews which mention how they don’t get along and often can’t be in the same room together on set. Also, both have been on GOT since season 1, and never appear to do promotional work together. I thought this was a known thing. She was on board first, then they brought Bronn in. When she found out, she had a contract written that she and Bronn would never be in the same scene. I would love to know what went down, because he’s still on good terms with his other ex-girlfriend. Bronn(Jerome Flynn) and Cersei( Lena Headey). Can’t wait for the next episode. [Optional] Obviously not seeing as how they refuse to have any interaction on or off screen. Lena Headey and Jerome Flynn, easy peasy. They’ve long been known to refuse to be in the same room with each other because their break up was so messy. Doubt they’ll ever get back together. Guessed it because they were on UK Skins together back in the early 2000s. LOL. Lena Headey (Cersei) and Jerome Flynn (Bronn). Supposedly, they had a stipulation neither would work together or be on the same set because they had a difficult breakup. Lena is engaged to her baby’s father so I doubt they’re getting together anytime soon. But then who knows. jerome flynn is married now but that doesn’t seem to matter in Hollyweird. I thought he was still single. Who did he marry? It’s Jerome Flynn (Bronn) and Lena Headey (Cersei). This is 100% Lena Headey (Cersei Lannister) and Jerome Flynn (Bronn). First linked in 2002, have made waves with reports that they’ve been kept apart on set/aren’t on speaking terms. This is Lena Headey and Jerome Flynn. They’ve never had a scene together so far because of precisely this. Jerome Flynn & Leana Headley. I read ages ago that they used to be a couple but now hated each other. Luckily their characters have never had to film together. Yet!